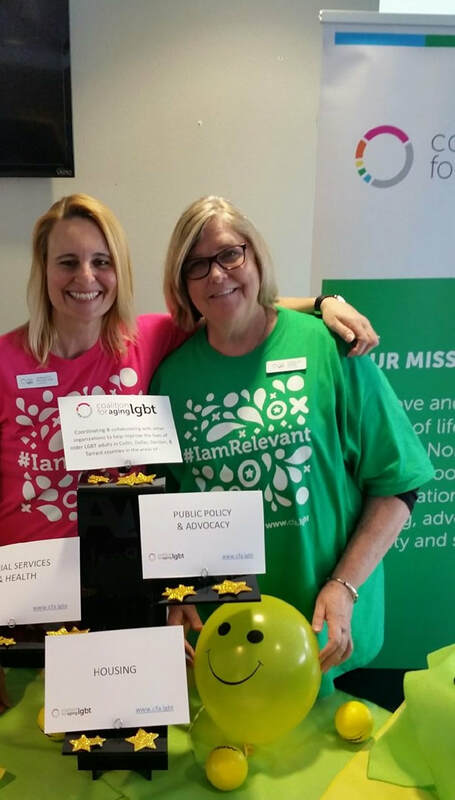 CPA/PFS, CGMA, Accredited Domestic Partnership Advisor (ADPA®) and CERTIFIED FINANCIAL PLANNER [TM]. Ms. Anderson recently retired as the Director of Business Unit Accounting at Texas Instruments supporting Financial Reporting for the business product lines as well as supporting financial process improvement and talent development. Prior to 2008, she served in various domestic and international roles in Operations, Finance and Accounting. Ms. Anderson’s community involvement includes service as a member of her homeowners association, and as a Deacon and Stephen Minister at her church. Ms. Anderson is the winner of D CEO Magazine’s 2012 Financial Executives Award for “Outstanding Chief Accounting Officer, Controller, or Treasurer – Public Company”. She is a US Army Veteran and continues to support Veterans through her lifetime membership with the Disabled American Veterans (DAV) and as a big sister in Big Brothers Big Sisters, Military Mentors Program. She is a member of and active in the AICPA, Dallas CPA Society, FPA, FPA-DFW, the North Texas GLBT Chamber of Commerce; and, also serves as the board treasurer for Coalition For Aging LGBT. Mr. Berck currently serves as the Healthcare Administrator at the James L. West Alzheimer’s Center in Fort Worth, Texas. In his current role, Mr. Berck oversees the operational aspects of the Center as well as the Center’s expansive student program that encompasses more than three-hundred students from high school to post-doctoral students. Mr. Berck has over 18 years of experience working in geriatrics, skilled nursing and home health professions. Sharing his love of the profession, Mr. Berck has served as adjunct faculty, teaching the Certified Nursing Aide course at Weatherford College in Weatherford, Texas and currently sits on the LVN/RN Advisory Board for the College. In his free time, Mr. Berck enjoys traveling and live Texas country music. In 2009, Mr. Berck was recognized for his outstanding leadership of his facility, Benbrook Nursing and Rehab, in Benbrook, Texas when the facility received the coveted Malcolm Baldridge Bronze Award from the American Health Care Association. Mr. Berck lives with his husband, Matt, in Weatherford, Texas. Kathy is a retired pastor of an independent, interfaith church, has held many leadership positions both professionally and as a community volunteer. Her career includes regional and national responsibilities for fund raising, volunteer development, training and staffing with the American Heart Association and with the March of Dimes. 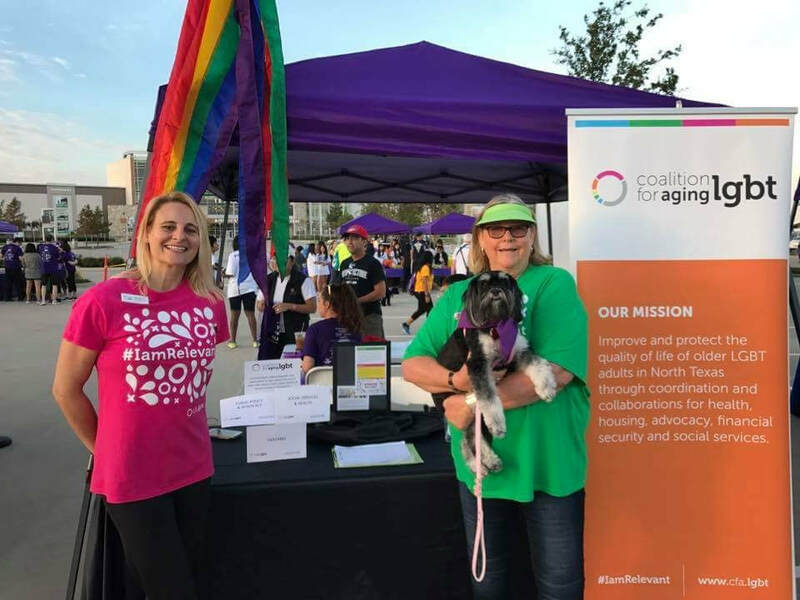 As a volunteer, Kathy has worked on or led committees, boards and task forces serving the LGBT community, notably: Oak Lawn Community Services, Life Walk, Women’s Chorus of Dallas, Leadership Lambda, and the Center for Non-Profit Management. For all this involvement, she was given the Kuchling Award during the Black Tie Dinner of 1997. Currently, Kathy is a board member with the Coalition for Aging LGBT and chairs the Tarrant County Organizing and Board and Volunteer Development Committees. Jennifer comes passionately to the board with 10 years of experience in the senior living industry. She is currently the Sales and Marketing Director for Bethesda Gardens Assisted Living and Memory Care in Fort Worth. Jennifer has a calling to those with dementia and Alzheimer's and is a Certified Dementia Practitioner who loves to educate families and the community-at-large on this important topic. 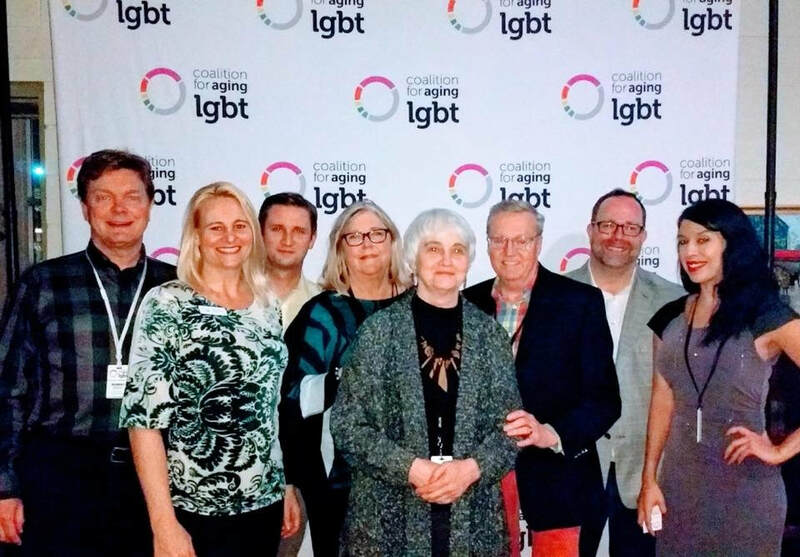 She is honored to be able to do this important work with the Coalition for Aging LGBT after having personally witnessed discrimination for the LGBT within the industry when looking into options for their loved ones for housing. 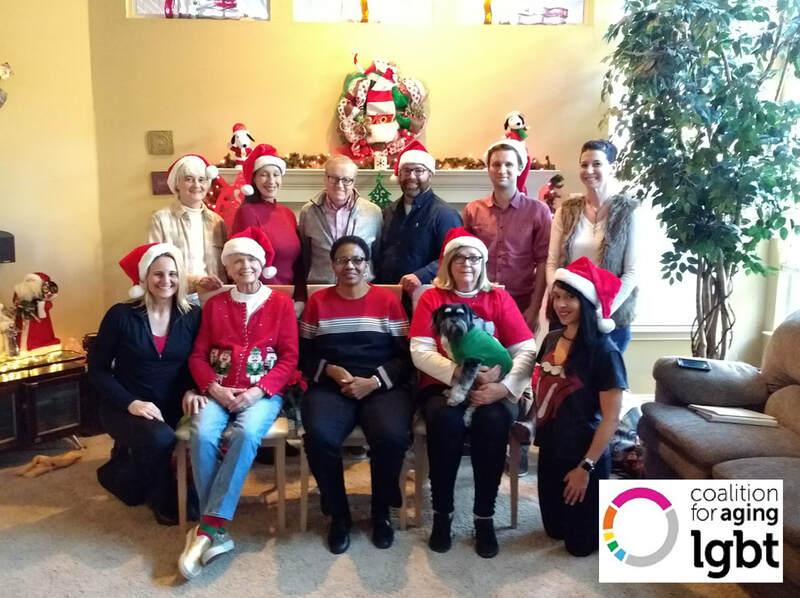 Jennifer currently serves on the housing committee as a volunteer, in addition to her most recent role as the Marketing Chair for the Coalition for Aging LGBT and proud board member. In her spare time, Jennifer enjoys spending time with her family, playing recreational soccer, acting in community theater with her son, and watching her daughter play volleyball. Robert is the President of SafeHaven, a corporation dedicated to bringing GLBT Senior Housing to Dallas. Robert is a founding board member of the Coalition For Aging LGBT, and serves as Vice Chair. Robert is also a founding board member of The Dallas Way: a GLBT History Project. He has served on the Board of Directors of Black Tie Dinner and was Grand Marshal of the Alan Ross Texas Freedom Parade in 2013. Robert currently serves on the board of the Friends of WRR, Dallas’ classical music radio station (101.1 on your FM dial). Cannon enjoyed a long career with Texas Instruments Incorporated, where he served in a leadership capacity of corporate finance. His assignments were in various parts of the world, including Japan, The Philippines, Italy, Germany, Taiwan, and Singapore. With corporate citizenship a driving influence in the culture of Texas Instruments, after retiring from TI, Cannon moved to the non-profit sector where he served the next 10 years as Chief Executive Officer of a US based human rights organization. Cannon has been studying the needs of the aging LGBT Community of North Texas for almost a decade. In February 2015, Cannon was invited to The White House for a National Summit on Elder LGBT Housing. 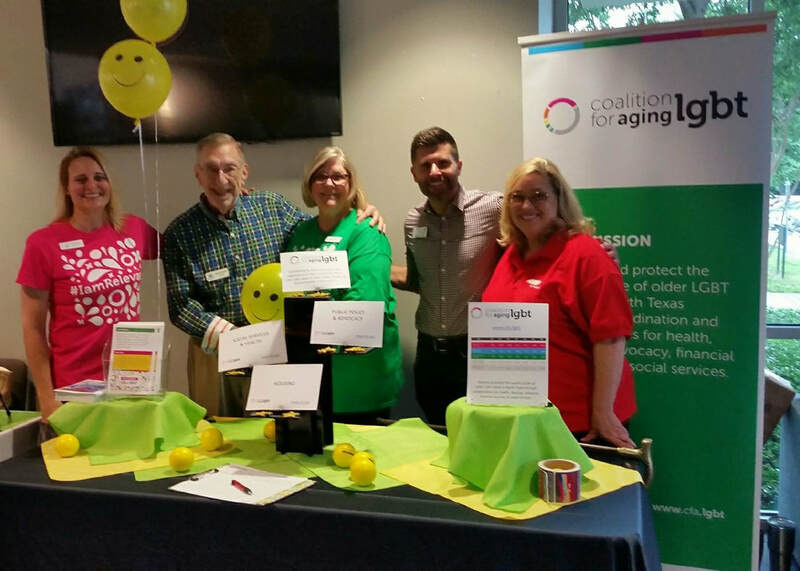 In June 2015, the Coalition for Aging LGBT held its inaugural Summit on LGBT Aging in Dallas with overwhelming interest and attendance. Cannon is married to Mr. RafiQ Salleh-Flowers. Brian Price has been a Senior Planner with the City of Dallas for nearly 5 years, focusing on neighborhood-based planning to support distressed and transitioning communities. He has a Master’s degree in City and Regional Planning from the University of Texas at Arlington and a BA in Anthropology from the University of North Texas. He has a passion for social justice, research, and program development to support vulnerable communities/ populations. 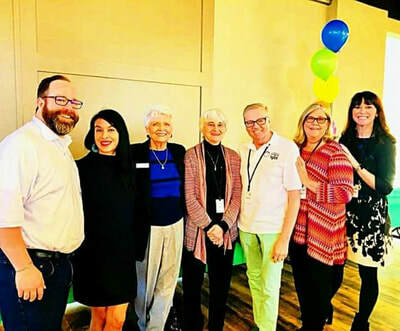 He is the current president of the LGBT Employee Association for the City of Dallas, working for two years with the organization to strengthen the LGBT friendly environment at the City of Dallas and develop a number of local partnerships where City employees can contribute to the community. Carolyn is recently retired from Legend Senior Living where she worked as the Assistant Director at Rosewood Assisted Living and Memory Care. This work was her “what do you want to do when you grow up” adventure. Prior to this she worked at several companies in Human Resources and left that field as the VP, Human Resources at Staff One. She is an Extra Mile Award winner and was recognized for her volunteer work on the Board of Oak Lawn Community Services and Chair of Lifewalk for two years. She also served on the Black Tie Dinner (BTD) Board as Chair of Board Governance and Secretary and BTD Advisory Board. Emma has been an entrepreneur in the Dallas-Ft. Worth area for the past 29 years. Currently, she is president/CEO of Cardiac Dynamics, LLC, a mobile diagnostic lab specializing in non-invasive cardiovascular procedures as well as temporary cardiovascular ultrasound staffing to doctors’ offices, medical clinics and hospitals in the North Texas area. She is a woman of integrity who believes that high quality patient care and excellent customer service is a “Right” that everyone is entitled to. Ms. Colquitt-Sayers is a registered cardiac sonographer (RDCS) and a MBA graduate from Texas Women’s University. Emma’s community support is exemplified through her active affiliations with the following organizations: Celebration on the Lake Church Board of Directors, Leadership Texas Alumnae Board - President, Committee of 30, an advisory board for Women’s Athletics, Florida State University, Grand Prairie Emergency Medical Services Advisory Board, YWCA Metropolitan Dallas Board of Directors, Arlington Museum of Art Board of Trustees, American Heart Association, Dallas Chapter Board of Directors, Junior Players Guild Board of Directors, Oak Lawn Community Services – Fundraising Chairperson and Board President, and Creator of Emma’s Elves, a Christmas project for families in need. 1989 Recipient –“The Extra Mile Award”, Honoring Dallas Women for their Community Service. Bruce is the Vice President of Provider Data Solutions for UnitedHealthcare and is an industry expert with a strong vision for the future of healthcare delivery. He leads a multi-functional organization which provides innovative solutions, automation capabilities and process optimization to improve the currency and accuracy of provider data. 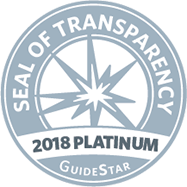 Additionally, Bruce is responsible for regulatory adherence to ensure data is managed according to standards set by federal and state agencies. He has 25 years’ experience in health care, leading large-scale domestic and international operations to support that vision of transformation. Bruce earned his bachelors’ degree from The University of Texas at Arlington. In addition to the Coalition for Aging LGBT, Bruce also volunteers to support veteran appreciation, children welfare and animal rescue. He was a former board member and board chair for Operation Kindness and a former board member for Frontier Performing Arts Association. Bruce currently lives in Dallas, Texas with his husband Jim Moore and his adorable (and spoiled rotten) fur babies.